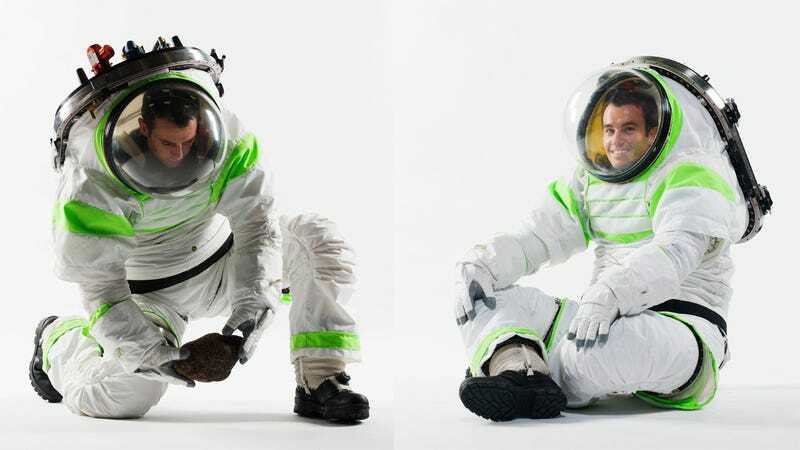 Check out these pictures of NASA's brand new prototype Z-1 spacesuits — do they remind you of anything? As Slashfilm points out, there's a striking resemblance to Buzz Lightyear — almost as if someone at NASA was a Toy Story fan. Buzz Lightyear has arrived. And NASA doesn't know where he's going. With the near future of the space program up in the air, NASA's building the prototype of its next space outfit to suit a variety extraplanetary missions. One of the key designs of the suit is a large port attached to the back, which astronauts can use to expediently enter and exit the suit. More importantly, the port can be used to dock the suit to the side of a shuttle or space station, bypassing the need for an airlock. It's efficient. The Z-1 prototype suit is also mobile. Bearings in the suit's joints will give astronauts the flexibility to hop over lunar or martian soil with more grace than the explorers who wore older NASA exosuits. But the basic technology remains the same as existing space suits, meaning astronauts will still fight against the balloons of air inside their suits to move, expending extra energy with every step or bend of the arm. Of course, since those balloons of air are keeping them alive, the trade-off is worthwhile. Read more about this suit over at Tested.